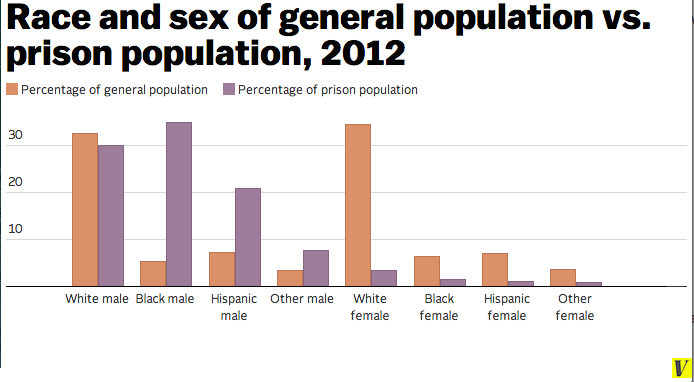 On any given day in 2012, there were about 2,400 teenagers serving time in adult state or federal prisons. And those teenagers were more likely to commit suicide than were inmates from any other age group. In other words, teenagers in adult prisons are twice as likely to commit suicide as are adults in adult prisons. 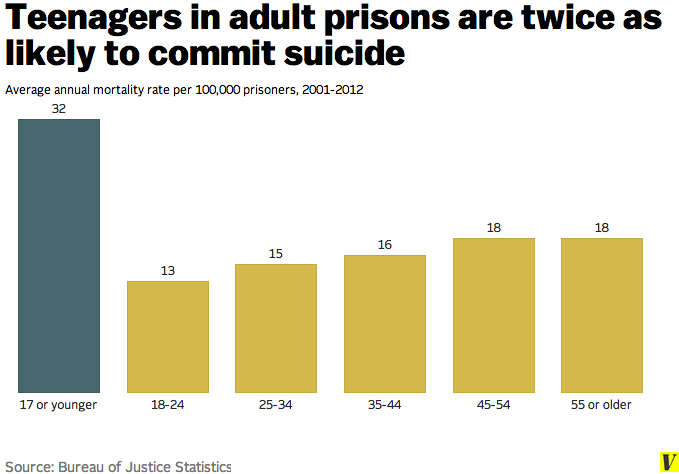 And they’re far more likely to commit suicide than teenagers who are in juvenile detention or in alternative programs. A 2007 report from the advocacy group the Campaign for Youth Justice found that juveniles in adult prisons are 36 times more likely to commit suicide than are juveniles in juvenile detention. Fortunately, the number of teenagers in adult prisons has declined over the last decade. 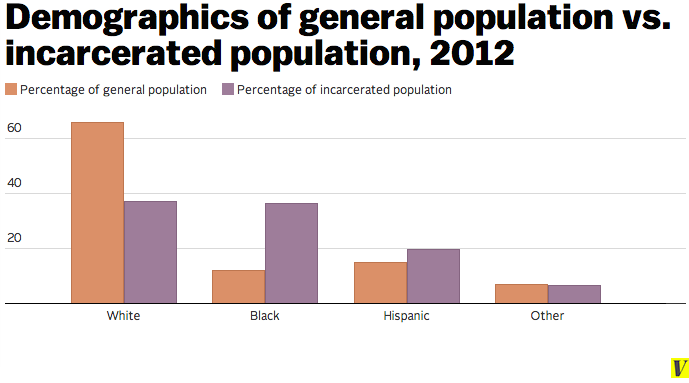 In 2002, there were 3,000 teenagers in state or federal prison; throughout 2008 to 2012, there were 2,500 or fewer. For one thing, (Browder’s brother) says, Browder was losing weight. “Several times when I visited him, he said, ‘They’re not feeding me,’ ” the brother told me. “He definitely looked really skinny.” In solitary, food arrived through a slot in the cell door three times a day. For a growing teen-ager, the portions were never big enough, and in solitary Browder couldn’t supplement the rations with snacks bought at the commissary. He took to begging the officers for leftovers: “Can I get that bread?” Sometimes they would slip him an extra slice or two; often, they refused. Browder got out of the Bing in the fall of 2011, but by the end of the year he was back-after yet another fight, he says. On the night of February 8, 2012 — his six-hundred-and-thirty-fourth day on Rikers — he said to himself, “I can’t take it anymore. I give up.” That night, he tore his bedsheet into strips, tied them together to make a noose, attached it to the light fixture, and tried to hang himself. He was taken to the clinic, then returned to solitary. Browder told me that his sheets, magazines, and clothes were removed — everything except his white plastic bucket. As I’ve written, putting teenagers in adult prisons doesn’t just increase their danger to themselves. They’re much more vulnerable to assault from other inmates. And teenagers who get treated as hardened criminals while they’re still high-school-aged are more likely to engage in violence when they do get out of prison. The problem with trying and incarcerating teenagers as adults is that it’s something of a self-fulfilling prophecy. Juveniles get treated as adults, in theory, because they’ve committed particularly serious or violent crimes—but even when controlling for the seriousness of the crime, and other factors, kids who have been imprisoned in adult prisons are more likely to commit further acts of violence than those who serve their time in juvenile facilities. Juveniles can also develop unsavory associates that will encourage them to commit more crimes after they get out. Pleasant knew one boy in prison who was sentenced to adult prison at the age of 16, and ended up “put in a situation where he had to harm somebody.” He got a new conviction after the incident, for 25 years. One theory for this: In many cases, police have used drug crime as a proxy for violent crime. It’s much easier for a prosecutor to guarantee a conviction on a drug charge—where there’s physical evidence that the defendant had drugs—than on a violent charge, where proving what happened is more complicated. And police target drug enforcement in high-violence neighborhoods, which are overwhelmingly black and Latino.